Social media marketing is perfect for products and local services, but other less tangible goods, can also get good exposure from social media, demonstrated particularly in the following case. A mobile application developer company (KS Mobile) built a fan base in an extremely short time, by using a Facebook promotion with an emotionally motivating grand prize. 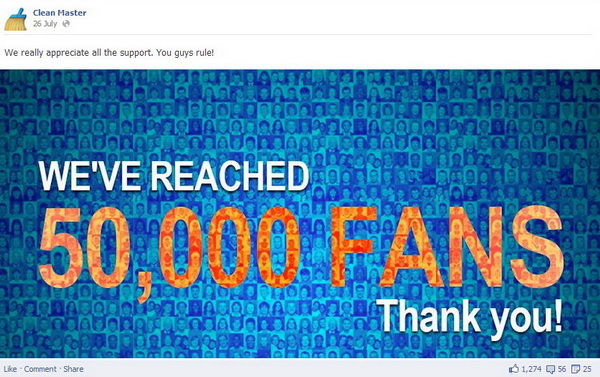 This allowed them to collect 33,000 new Page Likes and 5,347 subscribers in only 11 days! We will guide you through their methods, with Janet Jiang’s help the manager of this 11-day long campaign, and hopefully these tips could be fruitful for your business as well. We wanted to collect more fans on our Facebook Fan Page and mobilize our actual fans as well while creating deeper engagement with our brand. For achiving these goals we decided to run a sweepstakes on our Facebook Page. KS Mobile is a mobile application developer company based in the USA. It has created a free cache cleaning application (Clean Master), which has over 20 million downloads on Google Play. 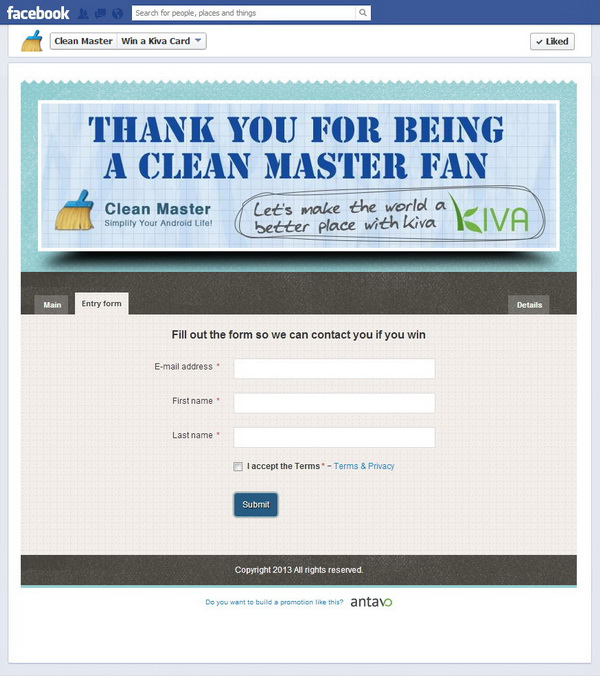 ‘Clean Master’ is one of the highest rated free utility apps with a 4.8 rating (out of 5) from 1,649,000 reviews. The company focuses its activities on the global market with their Facebook page. An interactive community on Clean Master’s Facebook page. KS Mobile’s main medium to communicate with their fans is through their Facebook page and therefore they wanted to increase the overall number of fans on this page. The main motivation for doing this was to boost their likes from 24,000 to 50,000, in order to generate new leads and create deeper engagement. To achieve this ambition they began looking for a promotion builder app. They found Antavo through Google Search, and subsequently decided to use it after carrying out some research, such as reading an article on The Next Web. 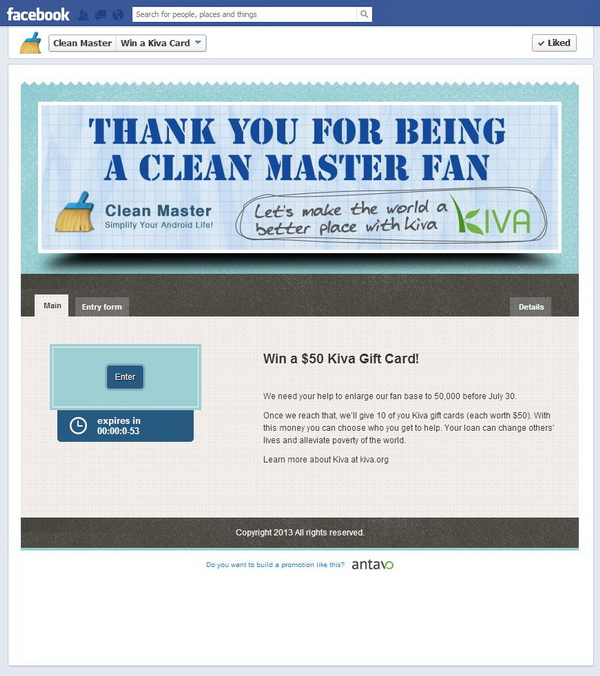 The company launched a draw with Antavo for 11 days and once completed they selected 10 winners and gave away a Kiva gift card (value of $50) for each and every winner. 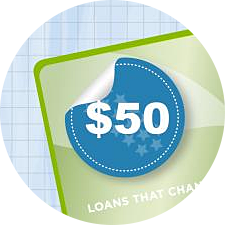 Kiva is a San Francisco based non-profit organization that helps the developing world with loans from everyday people. A simple draw on Clean Master’s Facebook page. Simplicity was crucial in encouraging Facebook users to engage with the promotion and ‘the draw’ operates within a much more straightforward process than the quiz or poll, because only the participant’s email address and name are required. Additionally, this was enhanced with a clear promotion design and easy to understand instructions on what to do. On the entry form the company only asked the subscribers names and email addresses. KS Mobile used 2 smart strategies to grow their Facebook community. Like-gating the promotion: visitors who didn’t like their page before were unable to see the content of the promotion and so couldn’t enter it – encouraging them to become fans first. With a like-gate they hid the content of the promotion from those visitors who hadn’t liked their page. Asking existing fans for help: they used this mobilizing message: "We need your help to enlarge our fan base to 50,000 before July 30. 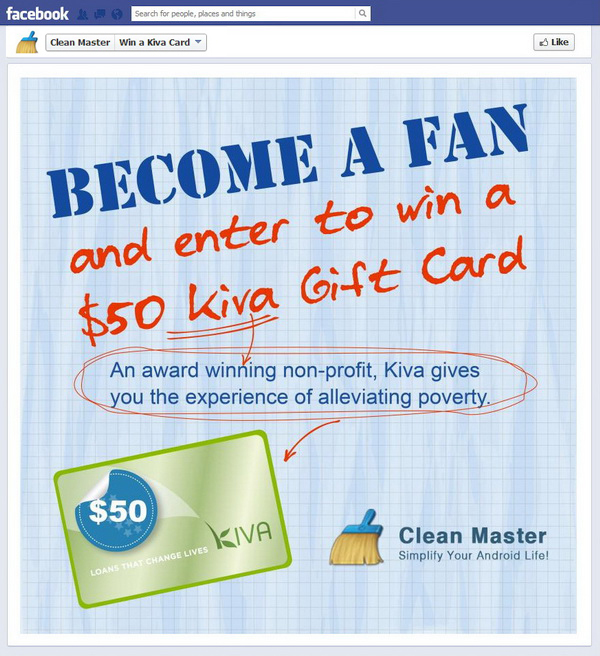 Once we reach that, we’ll give 10 of you Kiva gift cards (each worth $50)." – This is one of the most effective ways to stimulate true engagement! Fans who love your product and know that you need their help will take action and spread the word about your request. It makes them feel part of a community and supporters of your brand. Of course, mentioning the grand prize was icing on the cake. 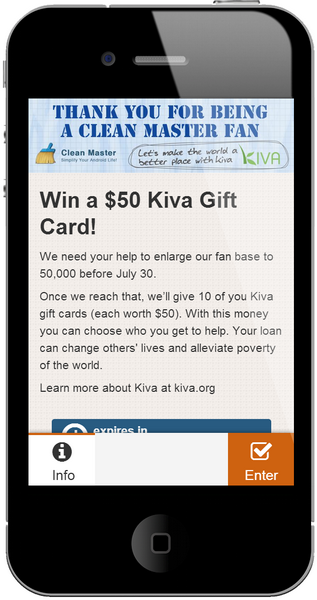 KS Mobile offered a Kiva gift card with a value of $50, creating an opportunity for the winner to be a supporter (someone who donates a loan) of an NGO. Why was it a good grand prize? 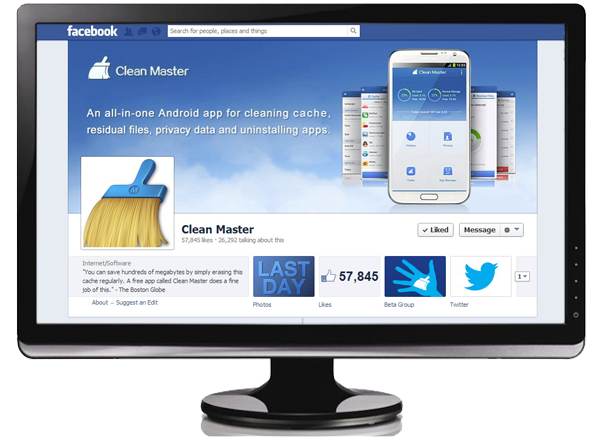 Clean Master’s main users are on mobile devices, so it’s great that they could enter the promotion from mobile phones. 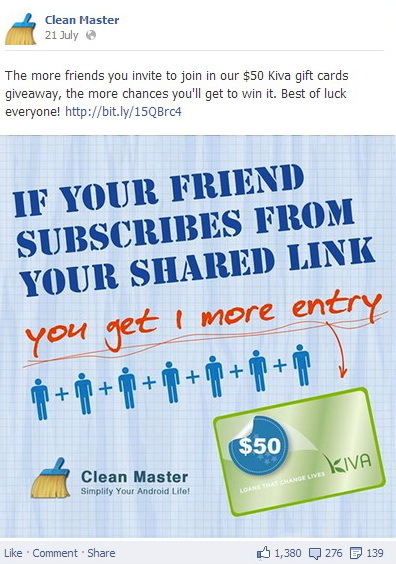 When the subscribers entered the draw, the promotion’s link was automatically shared on their friends’ News Feed, which had the potential to lead to even more visitors and new subscribers to the sweepstakes. The subscribers could gain bonus points after they invited friends who were redirected to the promotion through their shared links. Highlighting the benefits of referrals meant that users knew easily what to do to get a better chance of winning. The company also allowed multiple subscriptions daily which created a higher chance of winning. 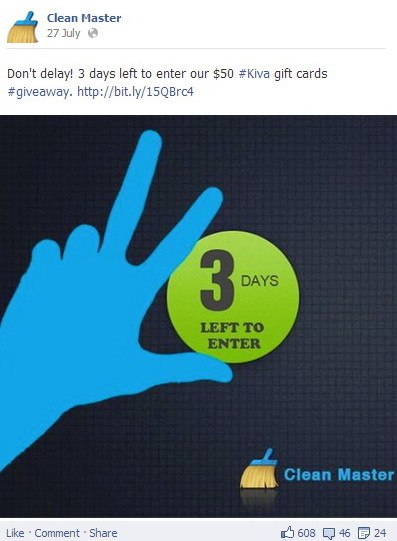 using hashtags in their call-to-action posts. 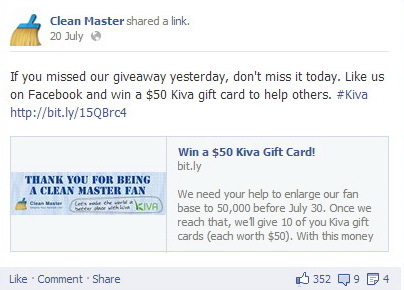 The company used #Kiva hashtags on its posts to attract those who are interested in Kiva. What are hashtags? If you attach this character (#) with a word, for example #giveaways, you can search for posts with this hashtag. Just type this into the search field on Facebook then all posts with this hashtag will be listed like in Twitter. One of the most attractive and clever uses of call-to-action images in Timeline posts was seen at their promotion. The company illustrated every single instruction, allowing the posts to be interpreted at a glance. 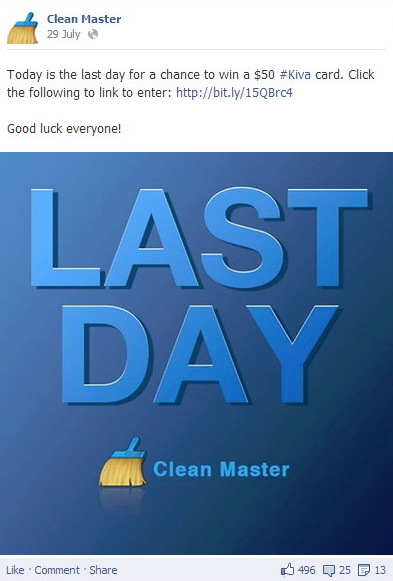 These posts generated more buzz on Clean Master’s Facebook page; many people shared them and commented on them. This motivated them to act on the spur of the moment. Call-to-action posts with easy to understand messages that announced the state of the promotion. Thanks to the great combination of the mentioned points, Clean Master achieved 50,000 new ‘likes’ on the 8th day of the promotion. They reached 50,000 likes on the 8th day of the promotion and collected a further 7,000 likes on the remaining days – in sum 33,000 new Page Likes were gained and their target was reached prior to the deadline. The cost of one subscriber was $0.10 and the cost of one Facebook like was only $0.01! (Including the cost of the grand prizes and the cost of the promotion) – It’s extremely good value! From 15,357 Facebook visitors they got 6,204 subscriptions, so the conversation rate was 40%, based on Antavo statistics - it’s a very good result. The number of subscriptions also showed that around 1,000 subscribers entered the promotion at least twice to increase their chances - thanks to the effective incentives, call-to-action imagery and grand prize. From 6,204 subscriptions they gathered 5,347 subscribers with unique email addresses. This new captive audience can now be harnessed and targeted more effectively, in the future, through their newsletter system. KS mobile provided a bright example, with easy to follow tips, which other companies from different specialisms and markets can use. Their great accomplishments particularly gaining 33,000 new Facebook likes and collecting 5,347 email subscribers are thanks to the fantastic use of imagery, an emotionally attached grand prize and the call-to-action posts and instructions. The next steps for the company might be to drive their new newsletter subscribers to their website. Antavo is a super easy to use tool. I like its templates, which make creating a beautiful promotion without HTML knowledge possible. That’s why Antavo is the only Facebook promotion app that we are using. We are very satisfied with it. 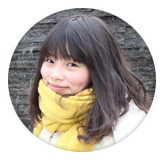 This case study is based on an interview with Janet Jiang the Social Media & Community Manager at KS Mobile.